There aren’t many single preamps that engineers and producers feel that they could solely use to make an entire record, but according to industry professionals, A-Designs Audio has built two: The all-tube MP-2A and the solid-state Pacifica. But we’re here to talk about the MP-2A (you can check out the Pacifica later). 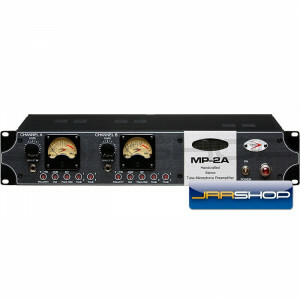 Designed to provide the versatility and sonic majesty the discerning professional requires for top-quality recordings, the MP-2A not only offers two tone switches per channel (four distinct sounds), custom transformers, plus polarity (phase) switches in order to treat any sound source as desired, it also gets top marks in “works and plays well with others.” Meaning, while some preamps can be finicky when it comes to certain mics, the MP-2A welcomes all and sounds great no matter what you put through it; ribbon, dynamic, or condenser. Whether you’re looking for clarity and transparency, or the rich, euphonic sound of input tubes driven hard, the MP-2A can give you all that and more. Each channel features a -20dB pad; two selectable tone switches for four possible tones on each channel; 60db gain for use with next-generation ribbon mics; and Cinemag input transformers coupled with custom-wound output transformers, delivering the low noise and top-quality sound you demand from a high-end preamp. Additional features include balanced combo XLR/1/4″ inputs, true VU meters, phantom power, polarity switches, and front-panel, line-level input jacks.